392 pages | 84 B/W Illus. Many books on performance management or evaluation are about the public sector in general or specifically about some programs or organizations. Only a few of them target the public institutions. 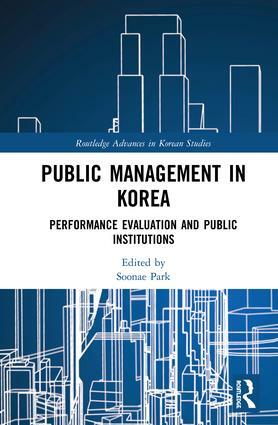 This book addresses what types of challenges that performance evaluations of public institutions actually face and how to overcome them through the analysis of Korea’s three-decade long experiences. This book provides detailed descriptions on how performance evaluations of public institutions have been implemented in Korea. At the same time, it provides comprehensive analyses on theoretical issues such as validity analysis performance measure, the dynamic change of efficiency of public institution, impact of price regulation on profits, and qualitative approaches for evaluating governance. Each chapter contains vivid theoretical debates and diverse views on performance evaluation and practical challenges, making the book a useful reference on managing and evaluating public institutions. Soonae Park is Professor at the Graduate School of Public Administration, Seoul National University.